The cleaver and butcher knife that Hugh “Pappy” Bosley used to cut up an estimated 250,000 mutton carcasses at his Moonlite Bar-B-Q Inn over a 40-year period are now enshrined in a permanent exhibit in the Southern Food and Beverage Museum in New Orleans along with a menu from 1963-65. Moonlite is the only Kentucky restaurant featured in the museum’s new “Trail of Smoke and Fire” exhibit on Southern barbecue. Patrick Bosley, spokesman for the family-owned restaurant at 2840 W. Parrish Ave., said the National Barbecue Association told him about SoFAB’s planned exhibit and suggested that he contact the museum. 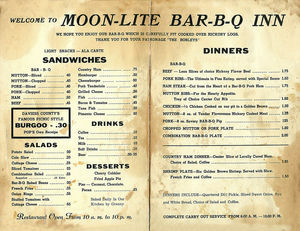 Photo submitted This 1963-65 menu from Moonlite Bar-B-Q Inn is featured in a permanent exhibit at the Southern Food and Beverage Museum in New Orleans. Moonlite is the only Kentucky restaurant featured on the museum’s new “Trail of Smoke and Fire” exhibit on Southern barbecue. As it turned out, the restaurant already had the perfect exhibit ready. The items are on permanent loan to the museum. Hugh “Pappy” Bosley would have celebrated his 100th birthday on Dec. 1, 2014. Patrick Bosley, his youngest grandson, said the exhibit also features a menu from the family’s first years of operating the restaurant. Mutton and pork sandwiches were 40 cents each. A chopped mutton or pork plate was $1. And the most expensive meal on the menu was a $2 combination barbecue plate. “This was an opportunity to capture Pappy’s legacy,” Patrick Bosley said. On April 17, the family flew to New Orleans for the museum’s reopening gala. It had opened on June 7, 2008, at the Riverwalk Marketplace in New Orleans. But after six years, the museum began moving to its own building at 1504 Oretha Castle Haley Boulevard. The museum is more than exhibits, he said. It also serves meals and drinks that draw people in. Bosley said his family wants its part of the exhibit to tell the story of Kentucky barbecue and burgoo. Hugh Bosley was working two jobs, at Fleischman Distillery and Veteran Cab Co., until a layoff from the distillery in 1963 forced him and his wife, Catherine, to look at other opportunities. The couple — with no restaurant or cooking experience — sold their home and used the $5,000 profit as a down payment on the $50,000 purchase of a 14-year-old barbecue joint with 30 seats, including stools at the counter. He was 48. She was 42. And they had five children. In the early days, Catherine Bosley waited tables while her husband barbecued meat outside. At Hugh Bosley’s death, the restaurant seated 350, served more than 350,000 meals a year and had annual sales estimated at more than $5 million. It served meals to such people as President Bill Clinton, former Vice President Al Gore, former second lady Marilyn Quayle, U.S. Sen. Evan Bayh, Jim Nabors, Bill Monroe, Pam Tillis, William Shatner, Kevin Costner, Reba McIntyre and Emmylou Harris. That’s the legacy that those few items in the new exhibit represent. Previous post: What is Mutton? Ron Hiott: Didn,t like mutton till I ate yours! Love it now. » Please sign our book. Copyright © 1996-2009. Moonlite Bar-B-Q Inn., Inc. All rights reserved.